After 180 minutes of football on his return as the Chelsea manager, Jose Mourinho must have learnt the work at his disposal is much more than a Wayne Rooney solution. The Blues boss confirmed that his club won’t make another bid for the Manchester United striker before his side’s crunch tie at Old Trafford on Monday night. But the indications emerging from the the Hull City game and Wednesday night’s hard-fought win over Aston Villa suggest that the Portuguese has a pretty huge task as he attempts to build another formidable team. Chelsea are European contenders, not just a Premier League club. Thirty minutes of frenetic attacking football saw Mourinho’s men dominate at Stamford Bridge as Hull adopted a cautious start to the game at Stamford Bridge on Sunday as the home side ran rings around them with many missed opportunities. But once the Tigers settled into the game and started playing with courage, it limited the power of the midfield duo of Ramires and Lampard to dictate proceedings. Hence the attacking trio of Oscar, Kevin De Bruyne and Eden Hazard struggled to create chances for Fernando Torres, and Lukaku, who later replaced the Spaniard. From then on, it was about being solid and compact. Aston Villa, who beat Arsenal at the Emirates last weekend, must have drawn inspiration from Hull’s bravery in the second half at Stamford Bridge. They therefore stopped the freedom enjoyed by Chelsea’s pivot men, pressing them high and forcing them to face their goal quite often. Paul Lambert’s men sometimes had four men hassling into their opponents’ half to distort their rhythm. It made Ramires and Lampard less effective and rendered the trio of Hazard, Oscar and Juan Mata ineffective. Then as Chelsea attempted to beat the freeze, Villa played a great high line defensive to frustrate their hosts. These are areas that would interest David Moyes and United. The former Everton manager could employ the pace and work ethic of Danny Welbeck to lead the shutdown in Chelsea’s central midfield while hoping that Michael Carrick could do a great job affecting play when the Blues lose possession. Carrick could also be the danger man to release the on-form Robin Van Persie should Mourinho ask his defenders to squeeze play by playing highline. Ramires, a mobile player, has understandably, played the standing midfielder role in the two games as Lampard loves going forward to bang the goals, but it could be more difficult to isolate the centre backs against the great movement and devastating finishing of Van Persie. Mourinho will have to decide whether to leave the club’s record scorer out in a big game. Lampard featured in last season’s victory at Old Trafford, albeit the title had virtually been decided at that the time. The manager has at his disposal Dutch youngster, Marco Van Ginkel who did a tactically impressive job in a pre-season loss to Real Madrid, while his Mr reliable, Michael Essien is also in contention for a place in the side. Van Ginkel could be an interesting risk as it means he would be making his first start at the 75,000 capacity. His motivation to impress his new boss could lead him into edgy decisions and make him vulnerable to mistakes. Yet starting the Dutchman against United could be a masterstroke- many would recall Oscar’s first start against Juventus at Stamford Bridge in the Champions League last season remains arguably his most memorable match for the Blues. Essien’s experience could be important against United, especially playing in his natural position, unlike Lampard. The Ghanaian who enjoys tremendous trust from his manager can be deployed for ‘special job’ and Mourinho is a man of surprises-he played centre-back Pepe in the midfield to thwart Messi and Barcelona during his spell as the Real Madrid manager. Essien’s choice though looks a distant decision having not featured at all in the first two games. Another obvious concern remains the choice of the three players behind the striker. Kevin De Bruyne who was named man-of-the-match against Hull was left on the bench for 90minutes to accommodate Chelsea’s best player over the last two seasons, Juan Mata who returned from injury. The Spaniard was largely quiet playing on the right while Oscar is preferred in the hole behind the striker. Oscar seems certain to retain his place, being a big away game, because of the tenacity he combines with inventiveness, while Hazard looks the most dangerous of the team’s abundant pool of creative talents. So will the boss recall the intelligent De Bruyne or reunite the trio who already have the experience of playing the Red Devils several times last season? Big decision to make and it could be interesting as the UEFA Super Cup comes on Friday. Mourinho will also have to decide whether to recall his £50million striker, Fernando Torres after leaving him out of the squad for the Villa game or select the young Romelu Lukaku who featured as substitutes in the first two games. After replacing Torres against Hull on Sunday, the Belgian, again, came on for the misfiring Demba Ba, troubled Paul Lambert’s backline. He came close to scoring, firing just inches away from goal. He also held the ball up, with purpose, better than his Senegalese counterpart. Lukaku scored a hat trick against United on the last day of last season while on loan at West Bromwich Albion where he plundered 17 league goals. Considering claims has been assured of a key role in the team this season, perhaps his performance against the champions at the Hawthorns could earn him a start at Old Trafford tomorrow. The Chelsea manager should also be worried by the performance of the duo of John Terry and Gary Cahill, who both looked unconvincing against Villa. Terry failed to close down Christian Benteke for Villa’s goal while it took two brilliant saves from Petr Cech to prevent Andreas Weimann from punishing the Blues. Gabriel Agbonlahor also came close with a curling strike that went just wide. And considering the chances manufactured by Villa who had only 39 percent of possession all game, Mourinho and his Chelsea side must be concerned against the ruthless Van Persie who would fancy himself against such porosity. 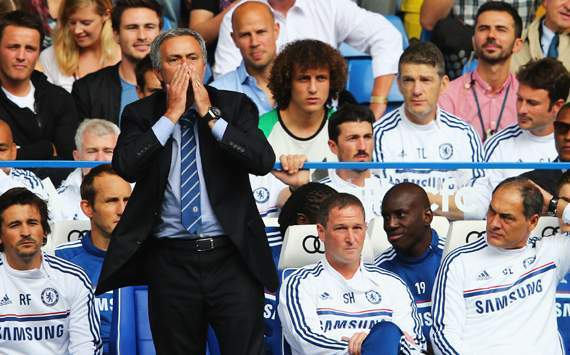 Clearly the Blues have suffered from the absence of a much more mobile David Luiz who is still recovering from injury. Cesar Azpilicueta could be a good option at right back, allowing Mourinho to move Ivanovic into central defence in place of the struggling Cahill. These are interesting calls to be made to get results and sustain team harmony. But then, Mourinho has the pedigree of being one of the best managers capable of navigating these tasks with efficiency. Do leave your thoughts below in the comments below. KTBFFH! Is Mikel Obi injured? Why is he been excluded from this article as an option in the pivot? essien to partner rami. hopefully obi is off to Gala. I think Benitez had made the squad that was capable of destroying the devils even at their home. I fancy last seasons’.matches against them and ofcourse they admitted defeats. Cech, Azpilicueta, Ivanovich, Luiz, cole, Ram/Lampd, Mikel, Mazacar, Lukaku.. the armry of destruction. Sub: Shwezar, Van Ginkel De Bruiyne Moses Torres,Cahill. i think moses should be given a chance while mata come as substitute to replace him. bcos mata has been struggling with an injury. Oscar is a natural replacement for that position, and from mata’s performance in the villa match, it is hard to see him start against manu. First, I ask, is this admin a Ghanaian? Putting Van Ginkel over Mikel…and who the f**k is JamesCFC another Ghanaian I presume. Hate or love Mikel that lad is fantastic the reason coaches past has always used him above Essien. He does his duty to the core. I really don’t understand why you guys don’t give him credit. If he was white…puff! He would have been nominated for a FA award. This writer…No! Most writers on Chelseafc360 are bias. No apologies! Mikel is better defensively but way too slow when it comes to surging forward. Mourinho’s teams are usually drilled to be very effective on the counter attack. Check Porto, Inter, Madrid and Chelsea 04-06. MVG is “fit-for-purpose” and I can assure you that at 20 years of age, and voted the Best Player in the Dutch Eredivise last season, he could only get better. I have watched the youngster in pre-season, and am very impressed with him. @kes, thank you. Who is Van Ginkel in EPL? Does he know more than Mikel? This guy help us to win trophies, but just now you feel he his not good for the job again. Very ungrateful!. At times the way people analyse coaches or games makes me wonder. You compare Mou of today to the Mou of yesterday. Noname or whatever you say your name is…and all other MIKEL HATERS, guess what? Mikel was CHOSEN over Essien and not only that, he saved our behind from conceiving a late goal. @kes, i didnt see any noticeable change in mou, especially in tactics. he either wins Or draws but never lose. At least we both agree on one thing: that mikel offers a lot to de team while on de defensive which he did dutifully. Play Mikel in the hole. That’s his natural position. He was only converted to DM when he joined Chelsea. In under 20 World Cup in 2005, he won the silver ball, only behind Messi who won the golden ball.